Building things with blocks is over. Now you can build things with bricks! Specifically Lego bricks, in Lego World, "a limitless collection of procedurally generated worlds made entirely of Lego Bricks" announced today by Warner Bros and TT Games. It's still in development but playable now, thanks to the magic of Steam Early Access. 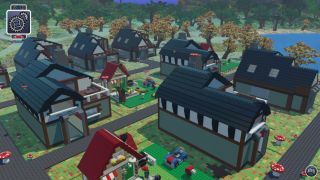 Lego Worlds hands players the keys to large-scale creation tools, but allows the creation and modification of items and environments on a brick-by-brick level as well. Worlds will be populated by various sorts of creatures and characters, who will interact with one another in sometimes-unpredictable ways. "Lego Worlds embodies the physical, Lego brick-building fun that consumers have enjoyed for decades, on a digital platform that delivers an entirely new type of experience with the beloved bricks," TT Games Managing Director Tom Stone said. "From the brick-by-brick editor, to discovering an expansive range of items, characters and creatures to populate your worlds—the creative possibilities are endless." The trailer looks good, and about exactly as Minecraftian as expected, and there will obviously be a great many comparisons made between the two. I'm not sure I'd want to be on the non-Mojang side of that equation, but then again, who doesn't love Lego? Monsters, that who. Lego Worlds is available now for $15/£12 on Steam.